The PA project has an innovative number board solution. There are very few photographs of the SP PAs running with engine numbers in the number boards. We wanted to ensure there was a way to accurately represent SP standard train numbers in the number boards. 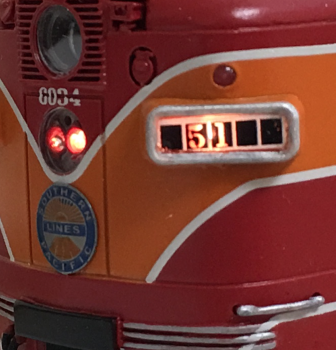 Included with each A unit is a selection of train numbers that align with most (if not all) of the possible train assignments a PA may have found itself on. Here is a photo of one of them assigned to the San Joaquin Daylight. We beleive this is a first for a brass model and seriously cool for the passenger train modeler.